On the RUBY PRESS roof terrace: Leonard Streich (Something Fantastic), Julian Schubert (Something Fantastic), Elena Schütz (Something Fantastic), Andreas Ruby, Ilka Ruby, Jeanette Kunsmann, Nathalie Janson (from left to right). Photo: Simon Menges. Ruby Press is a publishing house specializing on architecture and urbanism. It was founded in 2008 by Ilka & Andreas Ruby to harness new critical potentials in architectural publishing beyond the coffee table book. Closely collaborating with the graphic design agency Something Fantastic Ruby Press has developed a story-telling approach to architectural communication that engages textual and visual elements in a complementary way. Consciously overriding the stereotypical formulas of the text-only theory book as well as the all-image image portfolio, the books of Ruby Press aim to make the theoretical discourse of architecture sensual while anchoring its visual representation in a coherent conceptual framework. For that reason Ruby Press books boost a versatile culture of the architectural drawing as a prime tool to both describe and celebrate architectural space. 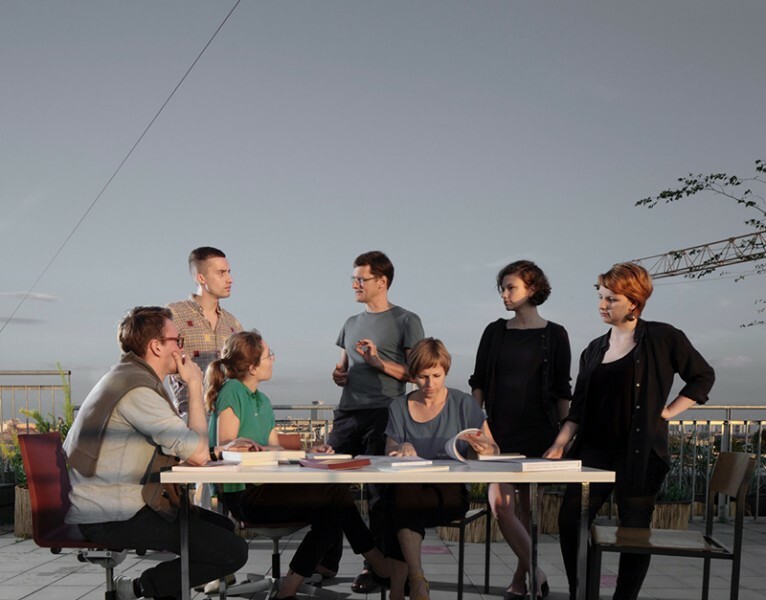 Trained as an architect and an architecture historian, respectively, Ilka Ruby and Andreas Ruby work simultaneously as critics, curators, moderators, publishers and teachers, they exercise their practice as “discourse engineers”, dedicated to communicating architecture beyond the usual suspects of the discipline to a broad audience. In addition to their intense publishing activities, they realised a number of curatorial projects, such as the video installation Endless Bauhaus, part of the Modell Bauhaus exhibition at the Martin Gropius Bau in Berlin (2009); the exhibition Druot, Lacaton & Vassal—Tour Bois le Prêtre for the German Architecture Museum in Frankfurt (2012); and Treasures in Disguise, the Pavilion representing Montenegro at the 14th Architecture Biennale in Venice (2014). Additionally, they have organized several international symposia on architecture and design, including the “Min to Max” symposium on affordable housing (2011). Both have been teaching architecture at international universities including Cornell University, EPFL Lausanne, UPC Barcelona, Ecole nationale supérieure d’Architecture Paris-Malaquais, TU Graz, UDK Berlin, Universität Kassel, and Peter Behrens School of Architecture Düsseldorf. Since 2016 Andreas Ruby is director of the Swiss Architecture Museum S AM in Basel.